The Harbor Springs Area Historical Society is pleased to once again present Shay Days, a celebration of inventor Ephraim Shay and his contributions to our community. In addition to his geared locomotive that made him famous, Ephraim Shay (1839-1916) designed and built the Harbor Springs Water Works, a stamped-steel building called the Hexagon House and a steel yacht called the Aha. The celebration of inventor Ephraim Shay takes place with Shay Days in downtown Harbor Springs. This family-friendly, two-day event features small scale live steam locomotives in Shay Park, kids games and self-guided tours of the Shay Hexagon House, crafts at the Harbor Springs History Museum and more! Shay Days activities will take place at Shay Park (the green space at Main and Judd streets), the Shay Hexagon House and the Harbor Springs History Museum. Bring your whole family to enjoy this special celebration of Ephraim Shay’s genius and to learn more about how Shay’s inventions shaped Harbor Springs. Activities on both Friday and Saturday include kids crafts and games at the Shay Hexagon House, live model steam trains in Shay Park and self-guided tours of the historic Hexagon House. Be sure to stop by the Harbor Springs History Museum to see a new exhibit on the life and work of Ephraim Shay in the museum’s temporary exhibit gallery. A walking tour titled “In Shay’s Day” will explore the Shay buildings and the former railroad grade of the Hemlock Central on Friday and Saturday. 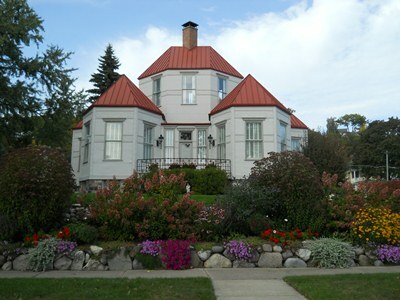 The tour begins at 10:30 am at the museum and reservations are encouraged by calling 231-526-9771. On Saturday, kids of all ages are invited to the Hexagon House to meet Ephraim Shay himself! Mr. Shay will be on hand to answer questions and talk with our visitors. As Shay Days is held around Shay’s birthday (July 17), it wouldn’t be a true celebration without cake and singing. Head to the Hexagon on Saturday at noon for birthday cake and be sure to wish Ephraim Shay a happy 179th birthday. Bring the whole family and discover more about Ephraim Shay and how his creative genius helped to shape Harbor Springs.